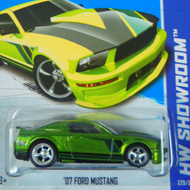 163/250 is part of the HW Showroom series and the 2013 Super Treasure Hunt set. The Ford features purple Spectraflame paint with white, purple & pink graphics on the sides and hood. The sides also have “Ranchero”, “TH”, and the Hot Wheels logo. The car has clear windows, a dark grey interior, chrome 10-spoke Real Rider wheels, and an unpainted metal Malaysia base. 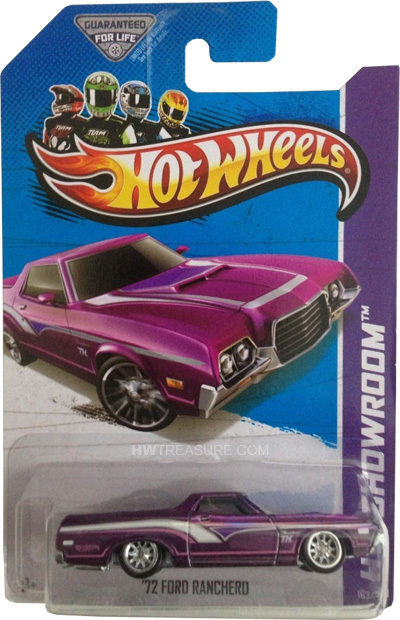 The Ranchero first appeared in the 2009 Hot Wheels Classics Series 5. It gets its likeness from the actual vehicle.